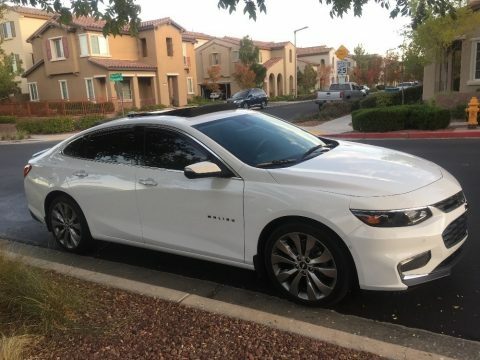 2017 Chevrolet Malibu Premier for sale in Las Vegas, NV 89135 This Chevrolet Malibu Premier is powered by a 2.0L Turbo Gas engine, paired with an 9-Speed Automatic transmission w/Paddle shift. There is only 16,700 miles on this Malibu. This beauty is shown in Summit White, has been garage kept and is non-smoking. Features: Panoramic Sunroof Driver Assist Collision Warning Adaptive Cruise Control Blind Spot Monitoring Cross Traffic Alert Custom Wheels Factory GPS New Paint New Tires Satellite RadioApple CarPlay Upgraded Sound System Added Rear Spoiler, Black Chevy Emblems, Bumper Guard, Side Sun Reflectors and WiFi ReadyNavigationWireless ChargerWi-Fi Hot SpotAutomatic ParkingLeather SeatsBlind Spot Monitor Please call (402)502-8385 for more information. ATTENTION BUYERS *Caveat Emptor* Please Remember to Inspect Vehicle Prior To Purchase!